This is my first book by Courtney Summers. I have heard nothing but good things about her so I was very eager to start reading FALL FOR ANYTHING, and boy was I not disappointed! I could not believe how incredible this book was. The book deals with death, suicide and the after math that is left behind, it is an intense and raw story. Eddie doesn't sugarcoat one moment of how she is feeling. She is angry, sad and alone. And can't stop asking herself the same question over and over again...Why? Why did her father leave her and her mother behind. Courtney Summers created such a powerful cast of characters, Each character had to deal with the loss of Eddie's dad is some shape or form. Milo, Eddies best friend was one of my favourite characters, he tried to keep Eddie grounded but it seemed the harder he tried the more she would push away. The love he had for his best friend was obvious, and jumped off the pages. What I loved most about this book was how real it was. I know that if I were in Eddie's shoes I would have gone to the great lengths she did to find out the answers. It is heartbreaking but beautiful. Full of personality and sadness. Reading this book was an emotional roller coaster, one moment I would be laughing and then the next I would be running for the Kleenex. FALL FOR ANYTHING went beyond all my expectations. This will not be my last book by Courtney Summers. She has me hooked! Her writing style is one of a kind and honest. I look forward to reading her other books! 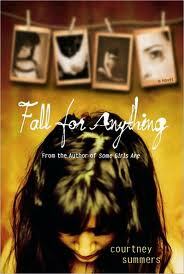 Fall For Anything is a lot of things including brilliant, sad, funny, honest, and true to name a few. So I beg you to buy this book once its released, to read and love it, to be completely fascinated in it in a way you aren't with most books, and to become a fan of Courtney Summers. I promise you you'll never once regret it.